Their football team left the field with a loss in Thursday night's homecoming game in Livingston Parish, but two Juban Parc Junior High football players still had huge smiles. That's because a plan they've been working on since last year got a classmate some special attention. They say that's the win that really matters. Inside JPJH is a student that everyone knows. Her class is not as large as others, but anyone will tell you her heart is. "She's kind towards everybody and has a really sweet heart," said Kallie Pope, an eighth grader at the school. Kallie said she's known Meghan Burns since the fourth grade. Teachers say Kallie is one of the girls who watches out for Meghan - at school dances and sports games. Dillon Boyle and Mathew Guzzardo met Meghan two years ago, in sixth grade. "She's got a good heart...she's nice to everybody," said Guzzardo. "I'll be in the hallway and I'll say, 'Hey Meghan' and she'll say, 'Hey Dillon, what you doing?'" said Boyle. Dillon said he was watching television last year when he saw something about a school voting a girl with Down syndrome as homecoming queen. He says that's when he decided to get his classmates to do the same for Meghan. And, he asked Mathew to help him. "At first, some didn't think we were serious," Guzzardo said. "Then, after we told a lot of people, most decided they were going to do it." Dillon said they really spread the word, mainly through their football team, and that's what really got things moving. So, Wednesday night when Meghan walked down the 50-yard line, as the announcer named those on the homecoming court, no one was surprised. In fact, there were lots of cheers when her name was called. And, her personality really showed through as she posed, while her list of accomplishments and awards from competing in the Special Olympics were read. Even though Meghan has Down syndrome, her classmates say she's no different from them. 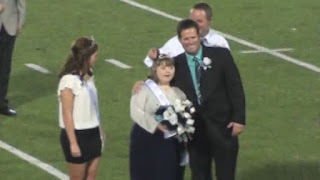 So, when her name was called as homecoming queen, the stadium erupted in cheers. "We just jumped up and started screaming, hollering," said Pope. "We were all in tears, so excited. Ran and hugged her. She was so happy," said Alexus Day, another classmate. Turns out, Meghan got 90 percent of the votes. "We knew 'cause so many people said they were going to vote for her," Day said. When Meghan showed up at school Thursday in her sash and crown, the students realized just how much the honor meant. "She's strutting her stuff," said Boyle. "Biggest smile on her face from ear to ear. It was amazing. Made me feel I did something good." Perhaps the students at Juban Parc Junior High have already learned what the poster in Meghan's class states, "Expect to be accepted for who you are." One of the teachers at the school says Meghan's mom told her she had no idea the kids cared so much for her daughter.